Delicate Fruit and Citrus Overtones - Our Gevalia Costa Rica coarse ground coffee brings a delicate fruit and citrus flavor to your morning ritual. Made from 100% Arabica beans, it brews a rich, full bodied coffee you'll love to indulge in. 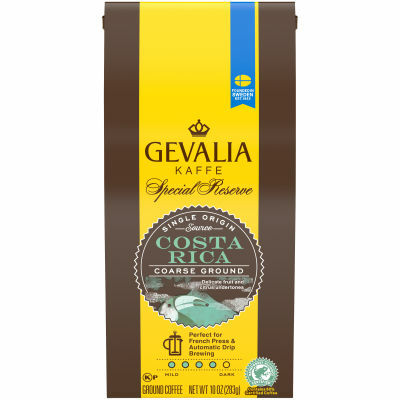 Fresh and Flavorful - Gevalia Costa Rica coffee comes in side tie bags that are easy to open and close to keep your coffee fresh. Perfect for French press and automatic brewing, this is a uniquely flavorful coffee blend to wake up to.